Recently, I was invited to a special event called the Taste of Europe at Table 9 at Hilton Dubai Creek. 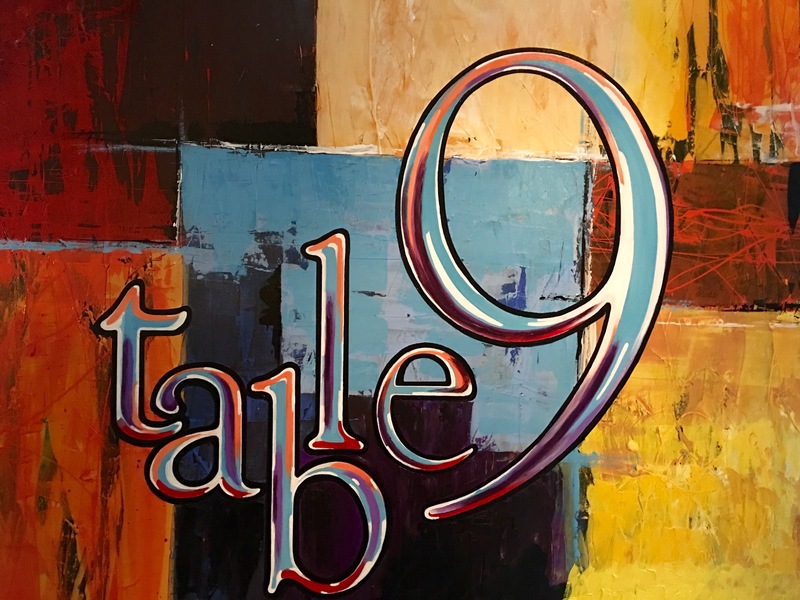 Table 9 is an award winning restaurant started by Chef Gordon Ramsay in 2011 and later it was helmed by his protégés Nick Alvis & Scott Price. 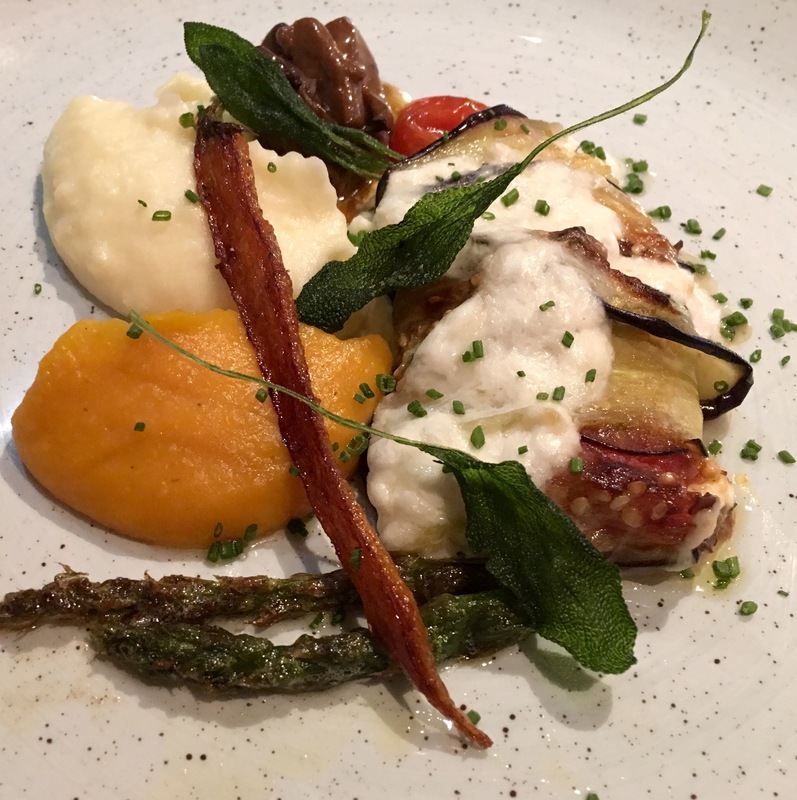 The restaurant has won many public and industry awards under the reign of Darren Velvick. 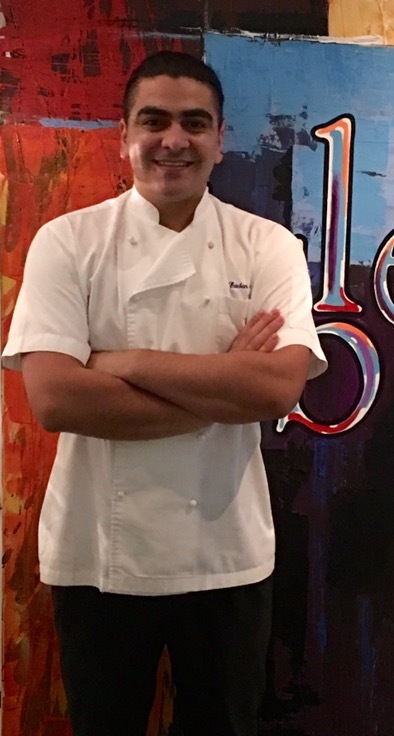 Now it is fronted by head chef Esteban Gomez. Table 9 is an unique concept restaurant, it has become a platform for talented chefs to create their own bespoke dining experience. You can expect original menu, high quality food, personalized dining experience and top notch service in a lovely set up. It is a modern version of a casual chic bistro. It is a great place to visit for a casual dinner with family and friends, or for a special occasion or the popular Dubai brunch. 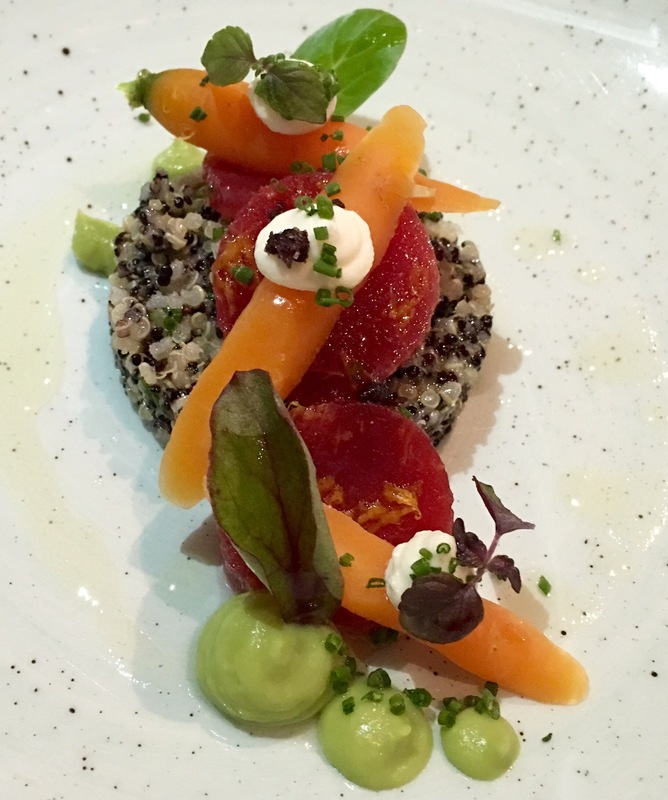 Table 9 offers a sleek and small menu, which makes it easy to order. You can order from their a la carte menu or opt for their 4 course tasting menu or seasonal menu. Daily Dinner- Relish a variety of specially crafted offering every evening. Priced at AED 175 per person daily, from 6:30pm till 11pm. Nosh Time- Unlimited chef’s selection of nibbles and drink. Priced at AED 125 per person, every Wednesday from 6:30pm to 8:00pm. Thursday Unlimited Wine- Great to way to start the weekend with free flow of selected wines for just AED 99 per person, every Thursday from 6:30pm to 10:30pm. Friday Brunch- Sample a variety of dishes from their menu every day. Priced at AED 290 per person, from 12:30pm to 3:30pm. A Taste of Great Britain- This event will take place on 14th October 2016 from 6:30pm to 10:30pm. London’s most celebrated culinary master, Brian Turner will cook up the best dishes from Great Britain at Table 9. Table 9’s cooking classes are very popular. Prior reservations are required. Let me give you details about the Taste of Europe event that I attended. It was a very personalized and enriching experience. I was taken on a culinary journey to Europe through Table 9. It was a 5 course dinner, featuring specialities from Spain, Portugal, United Kingdom, Italy and France. All the dishes I tried had one thing in common-They were packed with flavor. As I am a vegetarian, they customized my dishes accordingly. 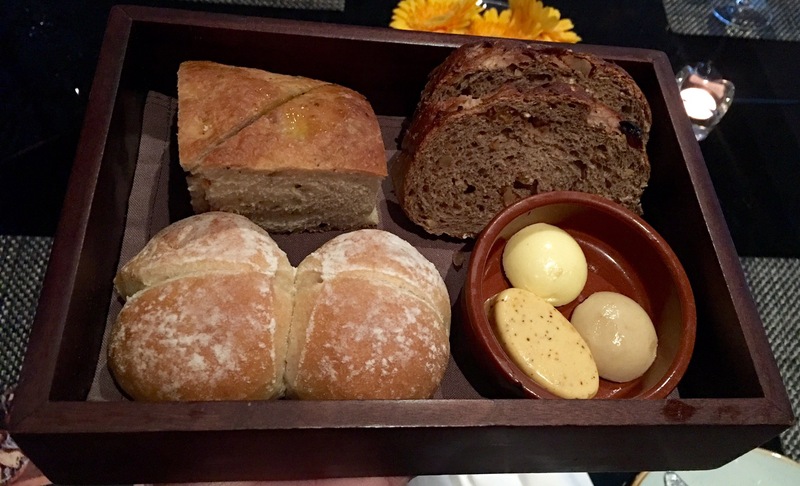 Before I could start my 5 course menu, I was offered freshly baked bread with different kinds of butter like Lemon Olive Butter, Spicy Butter and regular butter to start off my dinner. 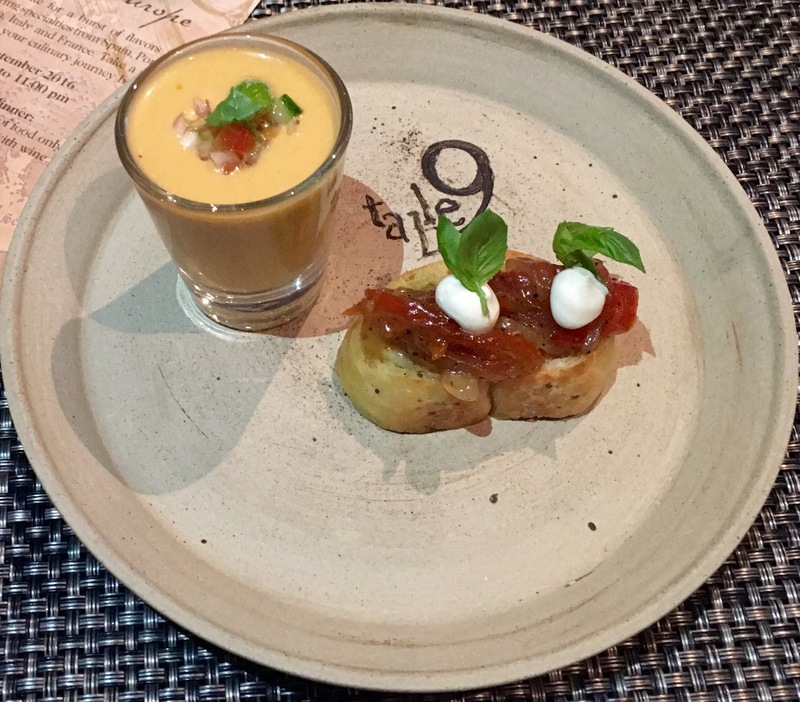 Cold Starter- The first course was a cold starter from Spain-Traditional Gazpacho & Anchovies Pintxo. The veggie version didn’t have anchovies. The Gazpacho was refreshingly cool and tangy. The sundried tomatoes(instead of anchovies) on the crisp bread was delicious. Hot Starter- The second course was a hot starter from Portugal. Instead of the Polvo a Lagareiro I was offered Quinoa with baby carrots and beetroot. It was a bit salty, otherwise it tasted good. Main Course- The third course which was the main course was a speciality from United Kingdom. I was served a vegetarian alternative of the Beef & wild mushroom pie, mashed pumpkin and potato. It was delicious. Pre Dessert- The fourth course was a pre dessert, the famous Vanilla Panna Cotta and Poached Pear from Italy. This course is my favorite among all the dishes that I tried. 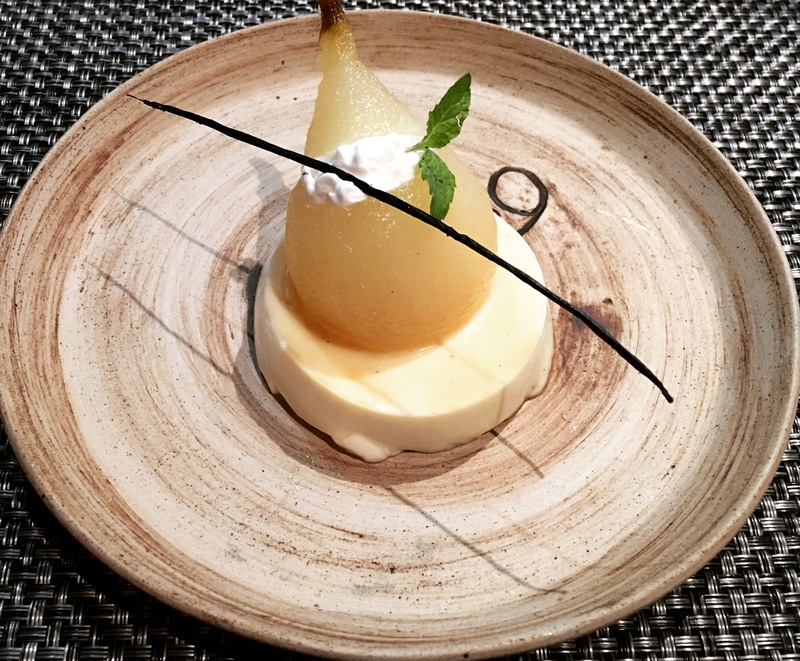 It tasted heavenly, one of the best dessert that I’ve had lately. Highly recommend it. Dessert- The last course was a dessert from France. 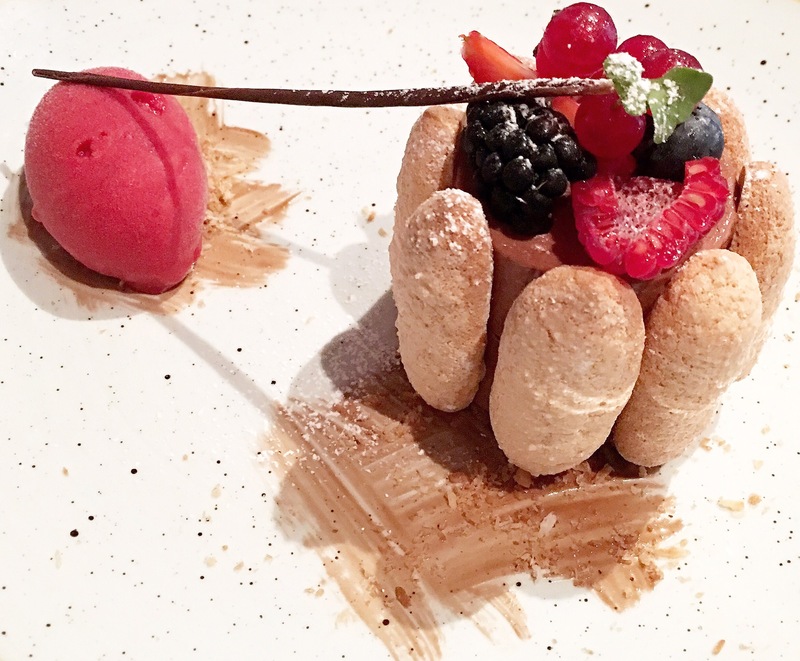 Chocolate Charlotte topped with fresh berries and served with Raspberry Sorbet. The Chocolate Charlotte was rich, creamy and indulgent. The sorbet was freshly made in the kitchen and tasted light, mildly sweet and very tasty. That sums up my experience of Taste of Europe at Table 9. What is praise worthy is that, they didn’t know I was a vegetarian and in short notice they cooked up a scrumptious spread. Table 9 at Hilton Dubai Creek is worth visiting. Are you thinking of visiting them? Table bookings are recommended.